It does the soul good to obsess compulsively from time to time. Going through picture after picture of your latest squeeze, viewing it from every single tiny angle possible. Hones the eye don't you think? Sieves out the non-starters, allows for refinement and ample time to revel in purchases that are NEVER. GOING. TO. HAPPEN. We all know that to which I refer. A a certain pair of ridiculous trainers with a certain in-built wedge. They fall within that sort of inexplicable 'I think I might have to have those or I'll collapse' category. They make very little sense. If someone had said to me: 'Olivia - how d'ya fancy a wedged trainer in your wardrobe? VB looked pretty snazzy that time she wore a pair to hit the first ball at a baseball match didn't she?' I would have issued nothing less than a withering, withering glance in their direction. Such an idea sounds positively rank. I'm not a fan of the bigger Marant sneakers - whilst I very much enjoy seeing them on Miranda Kerr et al - I wonder if they exist in a territory and time zone that only the long and very willowy of leg should dare stray. I prefer the more casual look of the Betty (above), it somehow feels more genuinely Marant-esque than the other bigger, bolder designs it sitsalongside. I particularly love the way the laces bunch up at the front - doing all that 'effortless' work for the wearer. However. It is the side-on view that raises concerns for me. Can't argue with the front - but the side... worries me. It can look a little... chunky, no? See how the shoes look PERFECT from the front, but a little wrong from the side? Or is it just me? Left: Everything one would avoid in a trainer, Right: Everything one would do anything required of to get one's mitts upon. I'd be very interested to know what you think. These little fellows are doing the blog rounds at the moment and opinion seems somewhat divided. Passing fade or a shoe you'd see yourself wearing for years to come? With Christmas a not-so-distant memory, I desperately need to step away from my credit card and save - but the Betty trainers make my tummy hurt with longing. They are fabulous, albeit inexplicably. Ahhh... I know the problem you speak of. 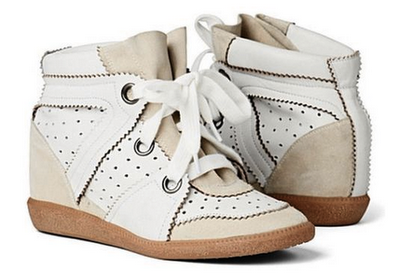 I've been looking at the IM wedge sneakers lately, from the Bekket to the Betty to the Bobby. The Bekket is really too much of a traditional 80's style chunky no holds barred kind of look (which is not my think). The Betty is adorable, but I agree, there are the same chunky shape issues because there doesn't seem to be a good slope above the foot. Same with the Bobby but because it is monotone, it doesn't draw as much attention to its shape. I've also started looking at other options such as the Bowie from Ash, which I find has a nicer, more defined shape and I like the color choices. Can't wait to see what you decide on! I agree with you on that the high-tops are pretty hard to pull off. I love the Betty ones, though, and I think they are here to stay for a while. I sort of like the chunky "side look"... my main problem would actually be to choose the colour. I'm always biased towards black but I've to say the white/beigy version looks pretty good. i think it's a look that would work IF you style it properly. i think it's a shoe that hits the leg at a challenging spot, though, and on principle i can't plunk down $$ for a pair of sneakers with a twist. but it's witty and fun!